Can you believe it’s almost Valentines day?!? We are so ready to celebrate this sweet season of candy, cuddles, and all things love. Since Valentine’s day is also a prime time for crafting, we’re seeking out all of the heart themed projects we can find. We love these heart shaped animals from personal creations for an easy Valentines craft fix. Simply choose which animal you want to craft, then print out the provided shapes to create a cute creature that you’ll treasure long past Valentines day. There’s a color version for a a quick and easy animal, or a black and white version that allows your little one to pick the creature’s colors. Once you’re done crafting, pair each animal with one of the suggested Valentines sayings for the sweetest gift ever. Those are so cute!! I would love to make these with my kids. Especially the red bird. OMG, those are too stinking cute! I want to make all of these with my daughter. She loves to do crafty stuff with mom. Thanks! I can’t believe it is nearly Valentine’s Day! 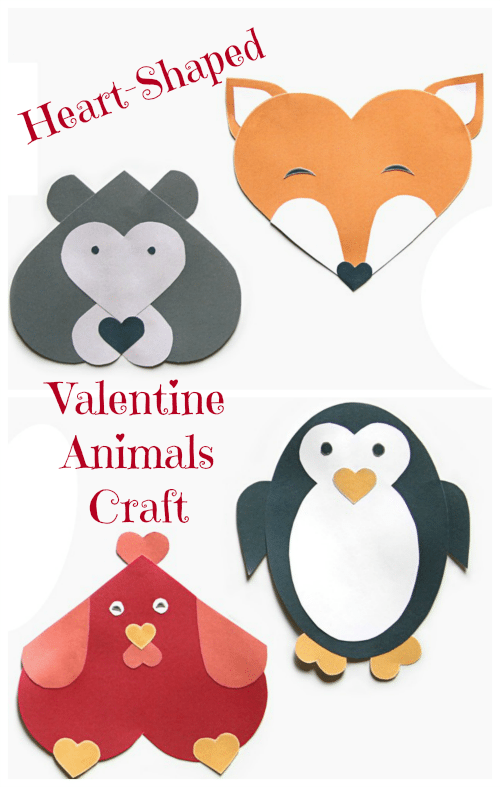 Love these cute heart shaped animal crafts – what fun ideas, and so easy to make too! These are so adorable and look fun to make! The fox is my favorite! These are such cute crafts! I need to have my kids help me make these. They are fun to make and yours turned out great! Such cute craft ideas. The grand kids love doing crafts. These are super cute ! Rainy day ideas! My girls would enjoy making the fox!